He owned his home free and clear of mortgage. The marriage was performed in the presence of Leon Vannier, Charles Vannier, and Robert Fauria. [S5] New Orleans Marriage Records Index 1831-1964, (Ancestry.com. New Orleans, Louisiana Marriage Records Index, 1831-1964 [database online]. Provo, UT: MyFamily.com, Inc., 2002. ), Vol 25, Page 144 (Reliability: 1). [S18] US-Louisiana-Orleans Parish-New Orleans Birth Records Index 1790-1899, (Ancestry.com Provo, UT, USA: The Generations Network, Inc., 2002. Original data: State of Louisiana, Secretary of State, Division of Archives, Records Management, and History. Vital Records Indices. Baton Rouge, LA. ), Vol 79, Page 920 (Reliability: 1). [S264] Social Security Application (original), Social Security Administration, Fauria, Robert Earl, SS no. 437-05-7286, 6 apr 1937, Application for Account Number (Form SS-5), Social Security Administration, Baltimore, Maryland. (Reliability: 4). [S227] Marriage Certificate, DUGAS, José Octave & FAURIA, Rita - 19 April 1900 (Reliability: 4). [S288] Birth Certificate, birth certificate, Louisiana Vital Records, no. certrificate #145 (18 Jan 1906), Norma Martha Fauria. (Reliability: 3). [S83] US-Louisiana State Death Certificates, FAURIA, Elden Nydia - 26 Dec 1911 - Vol 153, P 1030 (Reliability: 1). 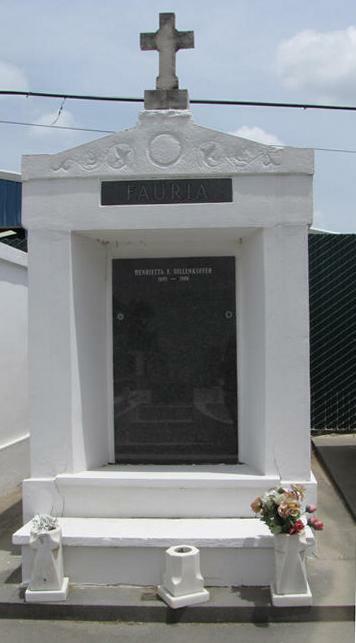 [S334] US-Louisiana-Orleans Parish-New Orleans-St. Louis Cemetery #3 Fauria Tomb ownership records, Saint Louis #3, Fauria, Frederick V. Burial 15 Nov 1950, Position V1; Metal casket. (Reliability: 3). [S227] Marriage Certificate, FAURIA, Frederick Victor and Alice Martha Vannier, 15 Aug 1903 (Reliability: 3).